Welcome to the start of the 2018-2019 School Year! As I write this message to you, I begin my tenth year as your principal. It continues to be a personal and professional privilege to serve our community in this capacity. The opportunity to work with families and children is one that I cherish beyond measure. Change is a word that can often cause great anxiety in others. I have learned during my ten years as principal to embrace change as a mindset. Each major change that has impacted me as well as our school has most often afforded our school a new outlook and even more promise of meeting the needs of all of our learners. Change will be a theme that is threaded throughout our school with the addition of seven new teachers to our Roundtown faculty! 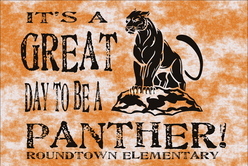 For comparison, Roundtown has not added seven teachers in my previous nine years combined, as principal! While the majority of these teachers are not new to the profession, they bring new ideas and tremendously add to our school’s culture and climate. We also take a moment to welcome all of our new families coming from new neighborhoods as a result of the redistricting that occurred at the end of last school year! Additionally, I am excited to welcome our new assistant principal, Erica Fabie to our school! She is a creative and innovative educator with excellent primary experience that will also enhance our school’s culture. Roundtown also welcomes several new support staff team members and some other itinerant teachers. Whether you are brand new to our school or a returning family, please welcome our new faculty and staff with open arms and embrace change! The Roundtown Family has been eagerly anticipating the start of school and has been busy learning about new ideas and ways to encourage, engage, and motivate our learners. Each new school year brings the promise of fresh hopes and dreams for our learners. We will continue our mission of being transparent and overcommunicating this year through online tools Skyward and Schoology. Schoology will be an important resource for you as we move forward during the school year. This tool will afford you, as a family, to stay on top of what your child is learning in combination with how he/she is doing. Additionally, we plan to grow our parent resources available to you to help your child and reinforce skills at home. We celebrate this idea at Roundtown that our learners are curious and have many questions about our world. Our school balances meeting the needs of our curriculum and teaching the fundamentals to your child along with satisfying their natural curiosities about learning. We do this in a variety of ways through literature, choice in learning options, activities with others, and of course, play! We will continue with our PRIDE Time activities and affording our learners opportunities to use different materials to construct and build their precious creations. We will also continue with our “Mindful” activities to help our learners increase their growth mindset and teach how to actively calm our bodies. Again, I’d like to take this opportunity to let you know how proud I am to be your principal. You can expect a message like to come from me at the end of each week! As always, please know I’m here to support and listen to you and of course, celebrate your child with you! It’s a GREAT day to be a Panther!